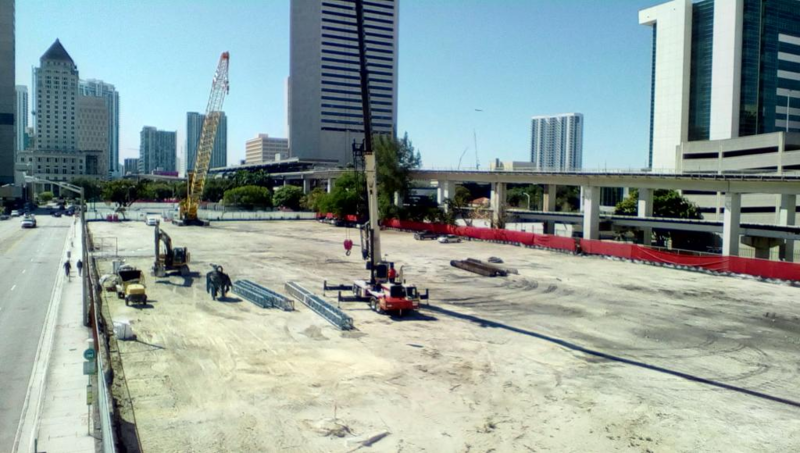 It appears that foundation work is about to begin on All Aboard Florida’s MiamiCentral project. A photo sent in by TNM reader Marc show that construction equipment is already on the site. The first phase of the project was granted final approval last month, and includes a train terminal along with 178,000 square feet of retail space. A supermarket is part of the plans. AAF is also finalizing plans for 700 MiamiCentral, which will be be built on the CRA’s Block 56 (details will be posted here next week.) The company will also soon submit plans for the second phase of the main MiamiCentral project. They actually have been working in one of the adjacent lots in front of the Overtown Metrorail Station for over a week now. They already finished drilling the pilings in that lot. In today’s Miami Herald, there’s an article about Tri-Rail’s need for $48 million (the state already promised $21 million) to build platforms at the All Aboard Florida station. I can’t believe that money is so hard to find. It seems like we find money for everything else, why is it so difficult to commit money for Tri-Rail and make this station even more useful for Florida train riders. There needs to be Tri-Rail connectivity here…would be pathetic if this thing gets built and does not have every form of transportation in South Florida connecting a hub to this station.